How do you drive a successful transformation? 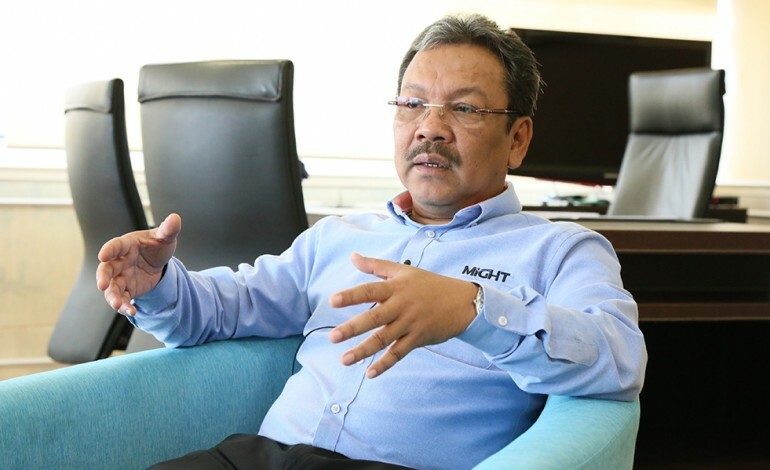 MIGHT President and CEO, Datuk Dr. Mohd Yusoff Sulaiman shares his views on the outlook of the high technology industry in the coming years. Employing foresight, we would be able to gain early insights and chart the way forward based on previous successes learnt from hindsight and leveraging on current strengths based on insight. Foresight empowers us with visions of possible futures that will enable us to prepare ahead and to be the early movers in seizing future opportunities and mitigate oncoming risks. By learning from hindsight and leveraging on insight, a nation can be moved strategically towards the future we desire. The theme of this year is indeed apt as Malaysia has been swept in the uprush of unprecedented waves of changes. With the tide of transformational changes yet to show signs of ebbing, the high technology industry must learn to ride these changes and leverage on the opportunities washed ashore and mitigate the risks that come along. As the popular saying goes, ‘the only constant is change’ and its winners are those that relish these changes with enthusiasm and energy as they see the gains and possibilities to make things happen for them. I also believe that a nation must not remain static. It must venture into new programs that will benefit itself in the short or long run. Like any other organisation, to survive, it needs to continuously re-invent itself. At MIGHT, we foresight these changes and its opportunities to make it happen not just for ourselves but more importantly for our partners. Foresight empowers us with visions of possible futures that will enable us to prepare ahead and to be early movers in seizing future opportunities and mitigate oncoming risks. By learning from hindsight and leveraging on insight, a nation, its sectors, industries, organisations and individuals can be moved strategically towards the future we desire. What is the next wave of high technology industry? industry is disruption. The world of tomorrow will not be the same as what we see today. This wave of disruption will also affect all levels of society and its impact will be deeply felt throughout the nation. Therefore, we need to prepare for this disruption and instead of being disrupted, we manage and plan this disruption by transforming it into a driving force for further national growth. strategies and plan for the changes. We tend to advise firms to partner with other companies in different sectors to ensure that their changes can bring more opportunities. From a regulatory standpoint, we are also in conversation with the government to amend some of the legislation on foreign investment, so that products developed in the country can be sold within Malaysian instead of being earmarked solely for export purposes. For example, solar panels manufactured locally with foreign capital, must be exported and then reimported if their end-users are based in the local market. Such policies need to be updated. We are in a new ball game: the private sector must explore new business models while the government must be proactive, responsive and amenable to restructure its policies to support the new revolution. It is high time for policies to be agile in this new age of technological disruption. that they have incorporated the common specifications from the users, then only will they release the software for sale to the masses. Even then, they will continuously upgrade the software for any glitches and/or customer’s suggestions. What does this mean to governments as policy makers? The policymakers too need to put their policies, blueprints and roadmaps in ‘beta’ and adapt them to the changing environment. The role of high-tech sectors in Malaysia’s transition to become a high income developed economy. If you look at the manufacturers of high-tech exports, most of them are developed economies. This clearly indicates the importance of the high-tech industry in developing a country. When one has the technology, the ability to expand improves. High technology’s role will be critical in this respect, because it also translates into sustainable growth. We encourage an increasing number of companies, particularly from traditional sectors to venture into high-tech. MIGHT will be there to facilitate and coordinate companies’ efforts to change and need for knowledge integration. This is how MIGHT plays its role as an effective platform provider bridging not just industry and government but also companies with technological solutions for the benefit of all. At the same time, we want to encourage the innovation ecosystem and ensure a continuous flow of new ideas and businesses. It is pivotal to attract young talents into STEM fields in view of the declining number of STEM graduates today and in the near future. It is then with the hope that national projects that are based on science, technology and innovation (STI) will be able to inspire Malaysians to embrace STI and become a science literate society of prosumers and not just consumers. We strive to lay out a clear vision for STEM so that young Malaysians can learn what Malaysia can offer in terms of high technology. 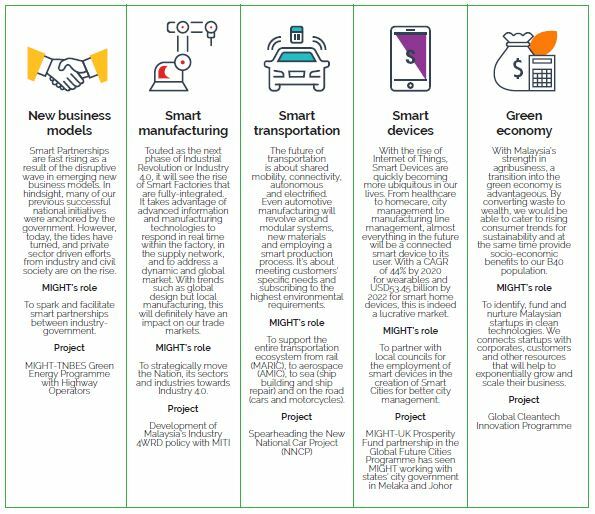 Emerging technologies such as the Internet of Things (IoT), 3D printing, biological gene sequencing and artificial intelligence (AI) are all areas that will shape the future of younger generations and the competitiveness of Malaysia in the coming decades. We need to make sure that educational requirements and curriculums are aligned to accommodate some of these new technologies which are already present in Malaysia.